Hidden away in foggy, uncharted rain forest valleys in Northern California are the largest and tallest organisms the world has ever sustained–the coast redwood trees, Sequoia sempervirens. Ninety-six percent of the ancient redwood forests have been destroyed by logging, but the untouched fragments that remain are among the great wonders of nature. The biggest redwoods have trunks up to thirty feet wide and can rise more than thirty-five stories above the ground, forming cathedral-like structures in the air. Until recently, redwoods were thought to be virtually impossible to ascend, and the canopy at the tops of these majestic trees was undiscovered. In The Wild Trees, Richard Preston unfolds the spellbinding story of Steve Sillett, Marie Antoine, and the tiny group of daring botanists and amateur naturalists that found a lost world above California, a world that is dangerous, hauntingly beautiful, and unexplored. The canopy voyagers are young—just college students when they start their quest—and they share a passion for these trees, persevering in spite of sometimes crushing personal obstacles and failings. They take big risks, they ignore common wisdom (such as the notion that there’s nothing left to discover in North America), and they even make love in hammocks stretched between branches three hundred feet in the air. Preston’s account of this amazing world, by turns terrifying, moving, and fascinating, is an adventure story told in novelistic detail by a master of nonfiction narrative. 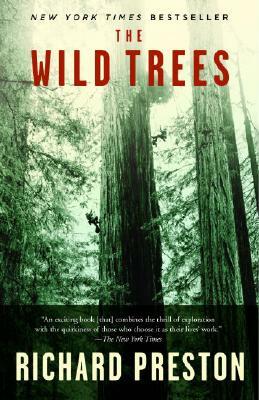 The author shares his protagonists’ passion for tall trees, and he mastered the techniques of tall-tree climbing to tell the story in The Wild Trees—the story of the fate of the world’s most splendid forests and of the imperiled biosphere itself. Richard Preston is the bestselling author of The Hot Zone, The Demon in the Freezer, and the novel The Cobra Event. A writer for The New Yorker since 1985, Preston is the only nondoctor to have received the Centers for Disease Control’s Champion of Prevention Award. He also holds an award from the American Institute of Physics. Preston lives outside of New York City.